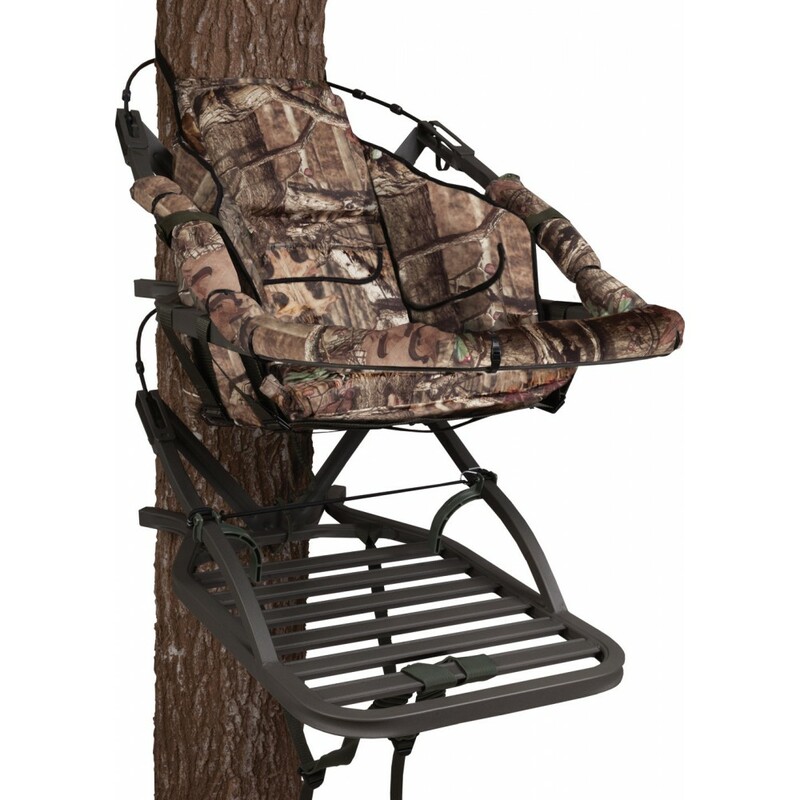 The 180 Max SD Climbing Tree Stand by Summit is one of the favorite options of most hunters out there. It is a great choice for a crossbow hunter, but if you use a gun every now and then, this product can also meet your expectations. This particular unit is loaded with a variety of features, so we do have to note that it is not the most affordable alternative ever to have seen the light of day. However, it is an investment that really makes sense for a hunter who is either professional or hunts to feed his or her family. You’ll be happy to know that this stand comes with a weight capacity of 350 pounds, which means that it can be used by heavier hunters or those who like to use as much gear as possible. Remember, when picking out a tree stand, you always have to consider your own body weight but also that of your equipment. Otherwise, you might risk endangering yourself by overdoing it. One of the best features which ensure your safety as you’re waiting for a prey to make its presence known in the environment consists of the full body harness that this model comes equipped with. You can use the bungee cords that are included in the purchase either to adjust yourself, your gear as you are sitting on the tree, or you can utilize them to carry the stand on your backpack. Furthermore, this particular tree stand comes equipped with the brand’s proprietary SummitLokt technology which means that, while this product is crafted from aluminum, it has been welded precisely so that it offers excellent rigidity and maximum strength. Every joint has been locked into place before being welded and each and every one of them is made specifically so that the stress on the weld is minimal. This product has a camouflage pattern on the arm rests and the seat, and the round seat that it comes with allows you to turn in any direction for quick and effortless position changes. It also has a significantly larger platform compared to many other models, including many developed by the same manufacturing company. You have a bit more space available for stretching out your legs. Another aspect that ensures you remain concealed and inaudible in the hunting environment is the fact that the product boasts a foam-filled aluminum frame. What this means is that, as you start to feel tempted to change your position following several hours where you’ve focused on your prey, there won’t be any metal on metal sounds to scare your potential targets away. We would like to note that this isn’t a highly portable alternative since it weighs in at 23 pounds. In case you didn’t know, there are tree stands that weigh just about seventeen pounds, and so they are significantly lighter. However, do consider that those also have limitations in terms of the amount of gear you can take with you on the tree or your specific weight. As stated previously, this one comes with a sizeable platform thanks to which you can stretch your legs. Furthermore, it boasts an extended top backrest, so you can benefit from comfortable support even if you are taller than the average individual. Another aspect you might want to know about is that the seat is height adjustable, which means that you can customize it according to your own physical attributes. 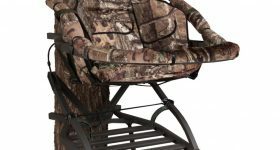 It’s becoming rather clear that this tree stand can offer you a lot in the way of making sure that your hunting experience is as comfortable as possible. Aside from all of the advantages you will be able to benefit from if you decide to go for this option, there’s another thing you have to consider and it’s that the Summit Treestands 180 Max SD comes with everything you might require. What that means is that the box includes a 4-point safety harness, pads, hardware, straps, and ropes, as well as Rapid Climb Stirrups. So, even though it is not the most budget-friendly unit out there, it’s definitely capable of offering plenty of value.